The police department in Manchester, New Hampshire, is asking people not to give money to people asking for it on the street. 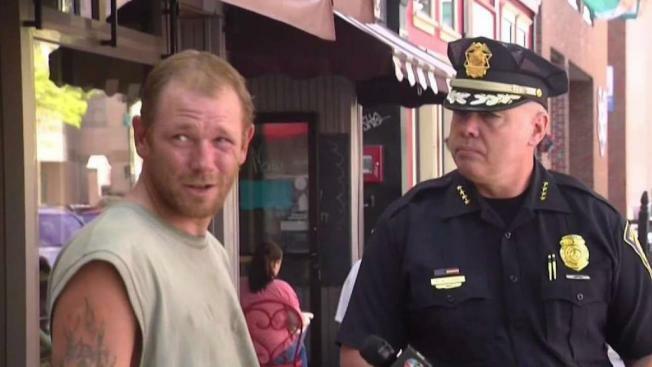 Panhandling in Manchester, New Hampshire, is becoming such an issue that the chief of police is asking the community not to give money to people asking for it. "It's causing an outcry in the city," said Chief Nick Willard. He says residents call his department almost every day to complain about panhandlers. "The last two, three years, it's gotten worse," said Manchester resident Jessica Perry. "My customers, when they sit out on the sidewalk, are approached continually," said downtown business owner Lee Gentile. In his latest effort to solve the panhandling problem, the chief is urging residents to stop giving handouts, warning that their cash is likely feeding a deadly habit. He says in the last two years, 24 panhandlers have overdosed on drugs, six fatally. "Given the fact that many are using heroin, fentanyl, and could even be using carfentanil, you are potentially contributing to the death of a human being," Willard said. Willard says officers are stepping up enforcement when panhandlers actually do break the law. On Thursday, Eric Robertson stepped into traffic. "A $62 fine," he told NBC Boston. Robertson is homeless and has been panhandling for two years. "I'm not a drinker or anything like that, I'm just out here trying to survive like everyone," Robertson explained. He makes $20 to $60 a day, but says the cash isn't the only thing he's here for. "People actually stop and pick me up, and I go mow lawns and weed-whack," Robertson said. He's afraid there's a dangerous downside if residents follow the chief's directive to stop the generosity. "I think it's only going to create more problems and make it worse by doing what he's doing," he said. "We're going to have to resort to crimes and I don't want to do that." Heath Palmer has been panhandling for years as well and shares that same concern. "If everyone stops giving, the people out here for drugs are going to turn to something else to supplement their needs," Palmer told the chief when they discussed the problem Thursday afternoon. "And the byproduct could be crime," Willard responded. “That’s what I am saying,” Palmer said. And while the chief tells NBC Boston he appreciates the panhandlers' perspective, he says his message to residents remains the same. "If they did not give them money, they would not stand on the corners," he said. "Eventually, it will disappear." If you feel compelled to use your spare change for good, the city has transformed old parking meters into donation boxes. And if you really want to make a difference, the chief is urging people to donate to the city's social services.